Health Fair Connections | Two Health Fairs a Year Better Than One? Some of you might be thinking there is no reason to have two health fairs in the same year. And for some of you, that might be correct - but that all depends on what you want to accomplish with your events. You might want to consider having a health/wellness fair (chiro, dentist, vision, and other vendors alike) and then having a benefits fair (your insurance carriers, EAP's, (401)k and vendors alike). This is going to give you a chance to have an event that is there to solely focus on the questions your employees have with their benefits. Allscripts' office location (pictured above) in Raleigh, North Carolina is a perfect example of having two successful fairs in one year. This location has over 2000 employees on site. They wanted to have a large health fair but did not have the space to host 25-30+ vendors. They used their cafeteria, but could only use a small section for the event. Meaning, they had the employee numbers to warrant a large health fair but didn't have the space to accommodate a huge event. So, they separated their health fair into two events. In the spring, they had a health fair. About 18 health and wellness providers attended. Not having all their benefits providers there opened up booths and allowed Allscripts to have a variety of health and wellness vendors which covered the health topics they felt were important/relative to their employee base. In the fall (around open enrollment time), they had their benefits fair. The benefits fair included 14 vendors - insurance carriers, supplemental carriers, EAP's, financial partners, as well as the massage vendor from the Spring Health Fair that all the employees enjoyed and requested back. Both fairs, though highly attended, ran very smooth, were not overwhelming to plan, and accomplished the goals of the HR team. 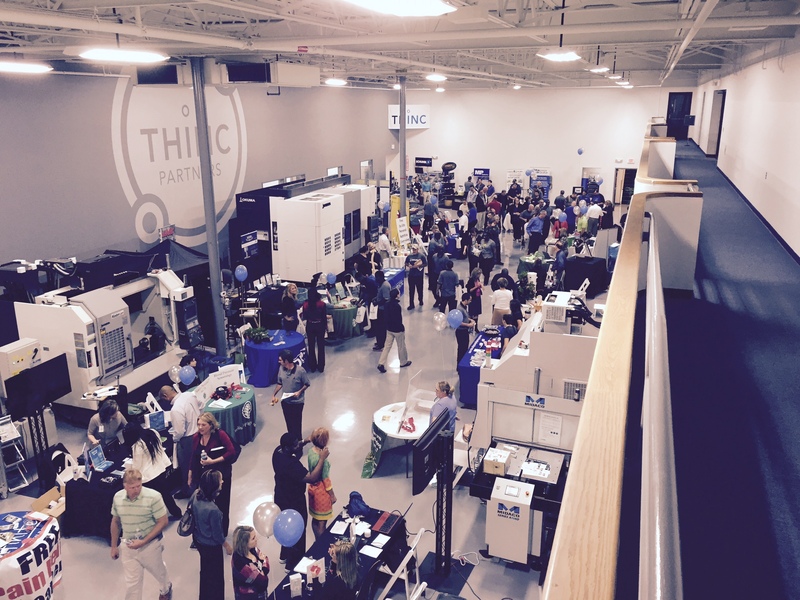 Okuma America Corporation in Charlotte, NC has a spring and fall health fair (pictured below). Their HR team wants certain types of vendors/awareness for certain times of the year. Therefore, they had a health fair in the spring as well as a health fair in the fall. Each health fair with completely different vendors and a completely different focus. The health fair in the fall focused on healthy eating for the holidays, indoor fitness, nutrition, blood pressure screenings, BMI, and other screenings and nutritional education. The health fair in the spring focused on outdoor activities, exercise, foot care, and additional types of training vendors like boxing or CrossFit. So, you might want to keep the seasons in mind when planning your health fair. Not enough space for a health fair venue can be a critical factor in having two health fairs in one year. 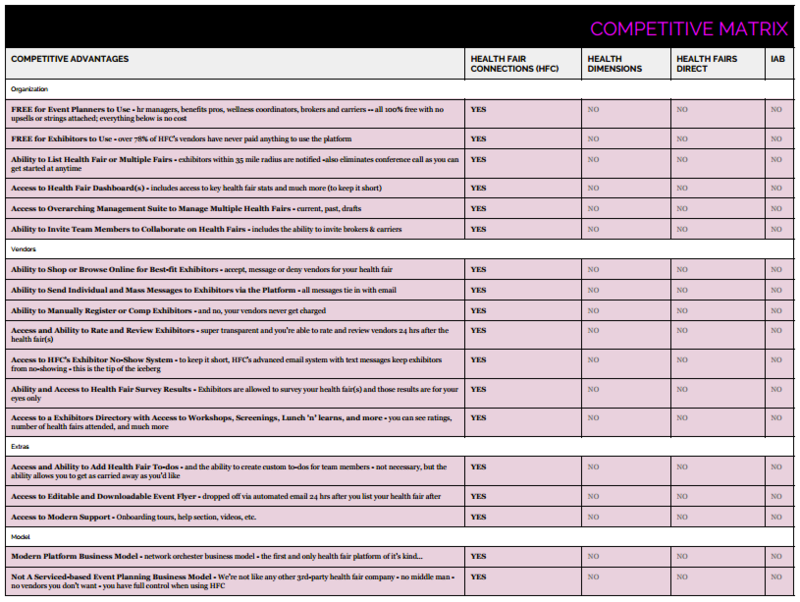 You might have room for 5-7 vendors, but you might have twice the amount of vendors you want to invite to your event. Two, "mini" health fairs would be an ideal solution if you find yourself running into this problem. And if you do not want to have just a benefits fair, you can separate your benefits carriers between the two health fairs. Having a hyper-focused health fair might lead to multiple events (not just two) in the year. These types of health fairs are solely focused on different aspects and education on one particular topic - sleep apnea, footcare, safety, nutrition, etc..
For example, you might want to hyper-focus on sleep, so your vendors could include a CPAP supplier, the sleep center, a primary care center, even a chiropractor - all of them there to focus on issues with sleep. I recommend a hyper-focused health fair if there is a particular type of education or topic that you want to get across and hit home with your employees. Whatever topic you select is going to resonate with the employees that attend your hyper-focused health fair. These few reasons alone should make you think twice when you start planning this year. So, keep these ideas and examples in mind when the time comes to plan your health fair (or should I say, "fairs"). And remember, you don't have to cram all your initiatives into one event.